For serious ice fishing anglers, having a good ice fishing rod and reel can mean a difference in tough conditions for a day of fishing. 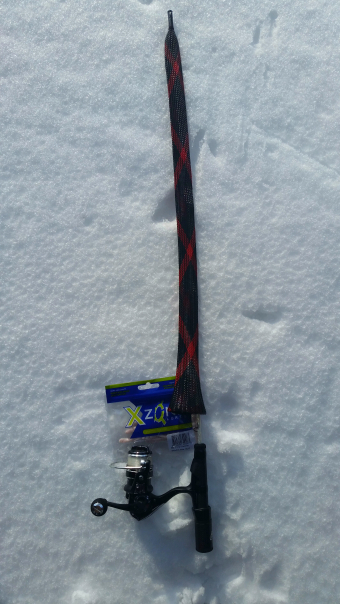 The Rod Glove Ice Gloves keep your guides and ice fishing rods protected while you are trekking across the ice. If you are heading out with an outfitter, you will still need to take along your own rods and reels. The ride from shore to the hut usually means that you are on a snowmobile or a bombardier and your gear needs to be protected. If you are walking from shore, then you will be dragging your sled and hut out and your gear will be stored in your sled. The Rod Glove Ice Gloves protect your gear from chips and bent eyelets during this travelling time. For myself, I keep my ice fishing gear in a milk crate including all of my rods, reels, and lures, and this container goes into my sled that I drag out on the ice. The Rod Glove Ice Gloves help to protect my ice fishing rods from getting damaged from other items in the sled including the auger and shovels. They also help to keep the snow and ice off of them making it easier to get set up once the hut is up at the desired hole. Available in 4 different sizes, if you want some protection for your ice fishing gear and are heading out on the ice, be sure to pick up some Rod Glove Ice Gloves at your local bait and tackle store or at our shop online. Written by Shelley Langley, the expressions and opinions are that of the author's.